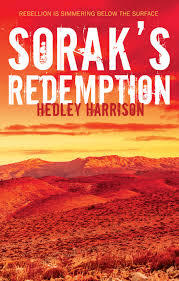 This book is the sequel to Sorak’s Redemption which was reviewed in 2017. As with all such novels it is best to read the first book in the sequence before attempting the second. Sorak’s Redemption had the potential of being a classic in the genre of malfunctioning dystopian societies. Sorak Returns to provide a picture as to how such a society can recover itself through pain, unhappiness and violence. 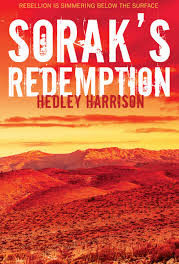 In Sorak’s Redemption an officer in the Red Regiment of the City deserts with her preferred male slave into a new Eden away from the authoritarian rule of a Senate of women rigidly ruling a society which has enslaved all men, identifying them by numbers only. Sorak’s rebellion challenged the established social mores, destabilised the government and initiated political revolution. Now we are seventeen years later. The Eden created by Sorak and her male partner Nasa has developed its own snakes along with an adolescent male child named Lenar so they need to relocate to a safer place. They set out on a journey which takes them into the hinterland of the City made doubly dangerous by armed groups of competing humans. In the meantime, the revolution in the City is cheerfully eating its children as this fragile, bizarre civilisation founded in a distant past by the crew of a wrecked space probe enters what might prove to be a final destructive struggle. The intransigent attitudes of the male polity that replaced the female dictatorship are simply and elegantly stated. Harrison consistently refers to the destruction of the Senate Archives which could have provided a sense of identity and continuity. The style of Sorak Returns continues in the manner of Sorak’s Redemption being written for the sake of the tale rather than as a statement of the author’s story-telling skill. The intense description and presentation of the political and personal aspects of the story are teased out within the wider narrative. This provides a wholesome integrity which ensures the reader remains grounded in the sequence of events laid out in the tale. This is the layered science fiction in the manner of the Golden Age of Heinlein, Asimov and many others. The central abiding theme is sexual equality or rather inequality. It articulates the clear social dangers of sexual inequality becoming both legitimised and institutionalised inside a system of political authority. It is about a society which has separated the production of the next generation from parental love and identity, thus removing valuable emotional sentiment from the reproductive cycle. It is a utilitarian society devoted to survival of the species within a hostile, alien environment, but which has degenerated into cruelty and violence. Perhaps this novel contains a timely warning for those of our species who misunderstand what society is actually all about. As the plot proceeds the political organisation of the city continues to decline into further barbarity. Someone needs to provide a solution and inevitably that task falls to Sorak but, as the narrative teases out this is no easy task. This tale can be seen as a story of Sorak, Nasa, their son Lenar and Desak, the girl he favours. It can also be seen as a tale of the consequences of social dysfunction and the struggle for reintegration. None of it is easy. Is this a story for our times, or a story of our times?